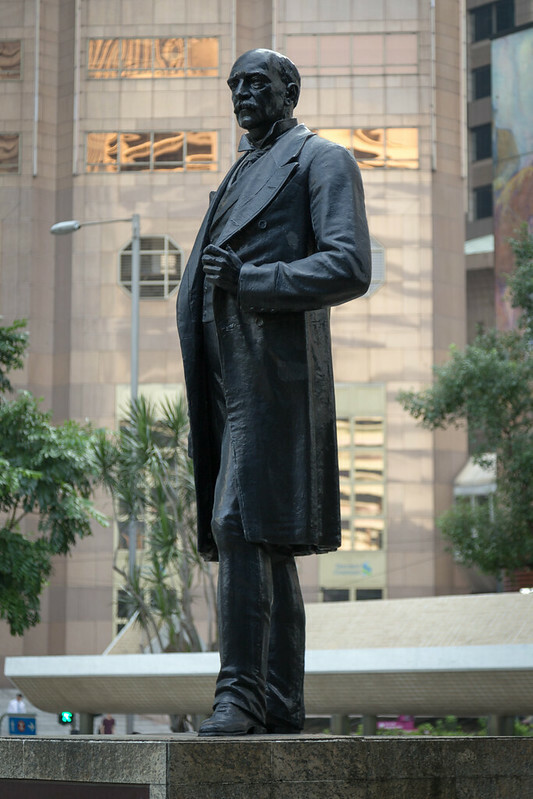 The statue of HSBC banker Sir Thomas Jackson in Statue Squre, Hong Kong. Sir Thomas Jackson, 1st Baronet, (昃臣) (1841 – 1915) was the third Chief Manager of The Hongkong and Shanghai Banking Corporation. He was responsible for financing the development of Colonial Hong Kong under the first large scale bank. Statue Square (Chinese: 皇后像廣場; lit. "Empress’ Statue Square") is a public pedestrian square in Central, Hong Kong. Built entirely on reclaimed land at the end of the 19th century, Statue Square consists of two parts separated by Chater Road into a northern and a southern sections. It is bordered by Connaught Road Central in the north and by Des Voeux Road Central in the south. The name is a reference to the statues, mainly of British royalty, which stood on the square until the Japanese occupation of Hong Kong during WWII. Today, the only statue on the square is the one of Sir Thomas Jackson, 1st Baronet, an early HSBC banker. Image published by ADTeasdale on 2013-11-05 18:44:37 and used under Creative Commons license.